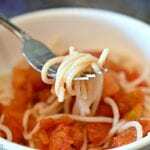 This easy spaghetti sauce recipe will help you put supper on the table in a hurry on busy nights when you don't have much time to cook. It's simple and it's frugal! Pour the ingredients into a saucepan if your frying pan isn't large enough. Add in the tomato sauce, garlic, oregano, and salt. Stir occasionally and let the mixture simmer until warmed through. Serve over warm pasta. If you feel fancy add a bit of Parmesan cheese on top.